The original sleeve of this Hit of the Week. Thanks to the release of the free version of Brian Rust’s Jazz Records 1917-1934, I found myself rather preoccupied as of late, and neglected to post in honor of Gene Austin’s birthday, so I’ll have to offer this a little belatedly. Gene Austin was born Lemuel Eugene Lucas in Gainesville, Texas on June 24, 1900. He grew up in Minden, Louisiana, and learned to play guitar and piano before leaving home at fifteen to join a vaudeville troupe in Houston, Texas. When he got on stage, his voice wooed the audience so that he was offered a job on the spot. In 1917, he joined the Army to fight in the War and wound up in New Orleans, playing piano in Storyville before shipping off. When he got back home, he planned to become a dentist, but ended up going back to vaudeville. Austin first began recording with country musician George Reneau, the “Blind Musician of the Smoky Mountains”, for Vocalion and Edison, singing and playing piano, and soon switched to Victor. With the advent of electrical recording, Gene Austin was among the first singers to exploit the more sensitive technique as a “crooner”. His 1927 recording of “My Blue Heaven” was one the best selling and most popular records of the decade. As the ominous clouds of the Great Depression rolled in, Austin was relegated to the budget labels, and as swing became prominent, his style soon began to sound dated. In the mid-1930s, he began appearing in minor roles in motion pictures. Austin continue to sing professionally for many years after falling from the spotlight, and in 1964, ran for governor of Nevada. Besides his singing, Gene Austin was also a songwriter, and originated such standards as “When My Sugar Walks Down the Street”, “How Come You Do Me Like You Do?”, and “The Lonesome Road”. Austin died January 24, 1972 at the age of seventy-one. Hit of the Week L 3 was recorded in October of 1931 in New York, and released at the newsstands on November 19, 1931. 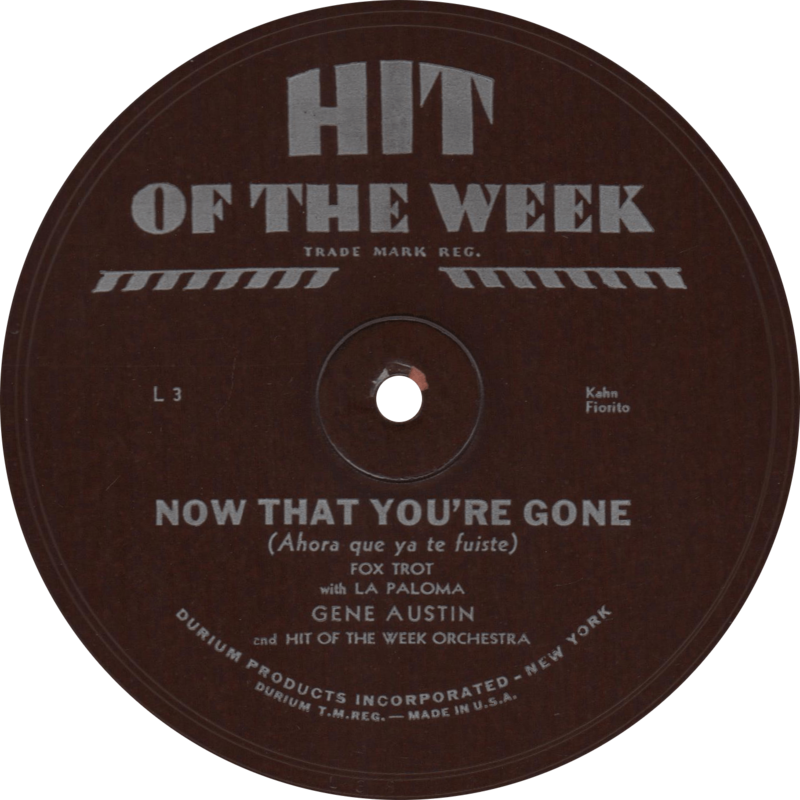 It was Gene Austin’s only Hit of the Week release. These Hit of the Week records were pressed in coated paper and sold for fifteen cents at newsstands. We previously heard Duke Ellington’s band on one of these unusual flexible discs. As part of the latter half of Hit of the Week’s releases, this disc has narrower grooves to accommodate a five minute recording on one side. On this single sided cardboard record, Gene Austin croons “Now That You’re Gone”. 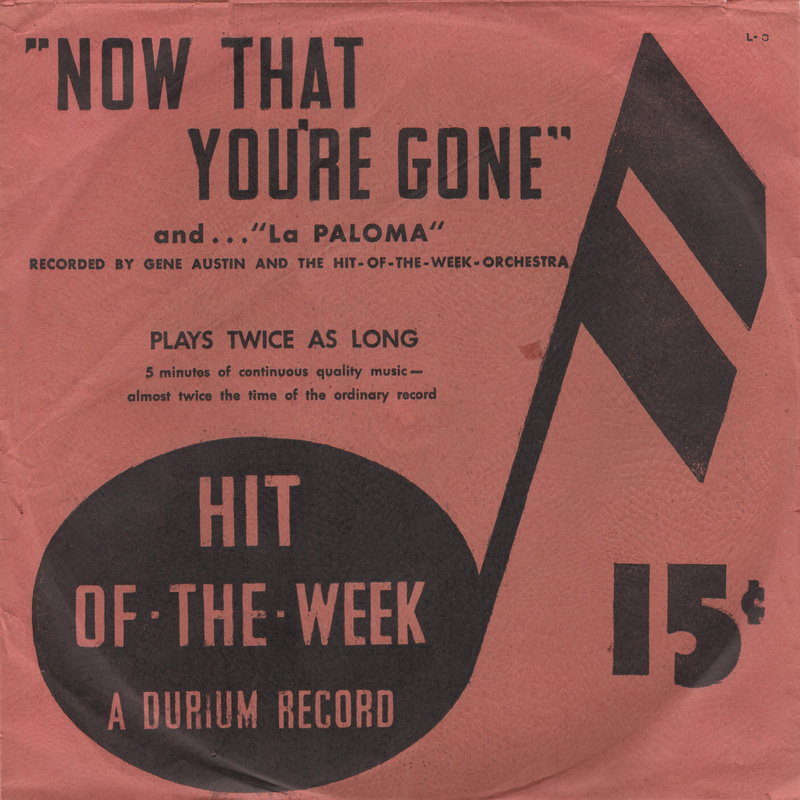 The second tune, “La Paloma” is an instrumental by the Hit of the Week Orchestra. Now That You’re Gone, recorded October 1931 by Gene Austin and Hit of the Week Orchestra. Updated with improved audio on May 11, 2017. This entry was posted in Records and tagged 1930s, 1931, Durium, Gene Austin, Hit of the Week, Jazz, New York, Popular, Sweet Music by R. Connor Montgomery. Bookmark the permalink.